Another creative endeavor I have undertaken is assembling family items into shadowboxes. Over the years Mother would take me up into the attic to rummage through boxes of baby things. I have fond memories of that. When I "inherited" those tattered and torn boxes, I found some real treasures. 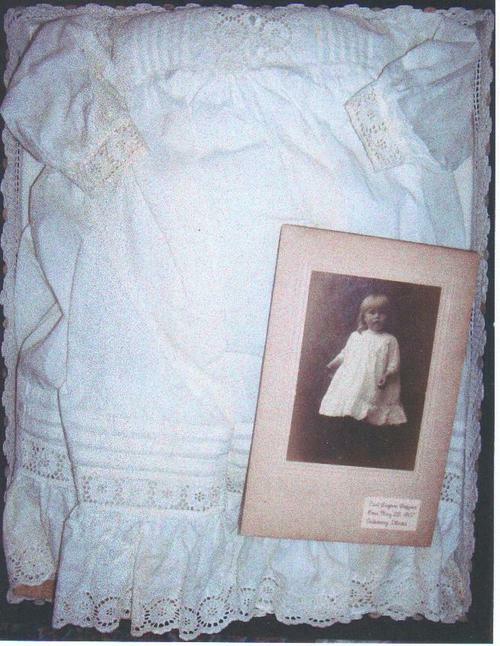 Here is a baby dress my Daddy wore (typical for boys in that era). One day I realized that I had a picture of my father (complete with long blond curls) wearing that very dress. I lined the shadowbox with a pillowcase that was edged with my grandmother's hand crocheted lace.